It’s thrilling that the artists in the In Response: Dialogues with RealTime exhibition are responding to our attention to their creations, years and even decades after their making and our reviewing. This is strange, rare and welcome: ephemerality suspended and hitherto unspoken dialogues given new voice and longevity. The loop formed between reviewer and work (implicitly the artist) is being regenerated, experiences recalled in vivid detail and estimations reconsidered: the loop keeps turning. In RealTime we have tracked the careers of Martin Del Amo, Vicki Van Hout and Branch Nebula. We have learned the language of each — images, movement, sometimes words. We know their bodies of work, if never utterly, for, being risk-takers, they always surprise with new works, as they did at first meeting when we entered their worlds and were changed, compelled to re-think possibilities of form and embodied thought. In our RealTime review-writing workshops both here and overseas we propose that encountering an artwork should be like meeting a stranger — a possibly intriguing, charismatic, complicated, unpredictable, difficult person — requiring patience and generosity to understand, let alone empathise with. Each work, after all, is an artist’s avatar. The encounter requires openness and self-awareness, knowing one’s own desires, limitations, aversions and prejudices, especially when dealing with the unusual works we were attracted to and which were burgeoning in the 1990s, if then being granted little serious critical attention. Borrowing from phenomenology, we see this encounter as a loop formed between audience and artwork, not only in the moment but in subsequent recollection, discussion with friends and, of course, in reading reviews and other writings. The more subtle or powerful the encounter, the more enduring the loop, with other opinions and responses fuelling it. The more deeply imbued in body and psyche, the longer the work is remembered, but it is also simultaneously subject to change as aesthetic, intellectual and political values evolve. As actors, writer-performers and producers for the two decades before we initiated RealTime, we knew what it was like to create a work over, say, a year or two, perform it for a few hours nightly for several weeks and to have it reviewed in considerably less time; the very real time of the work reduced to 300-500 words in a newspaper, sometimes insightfully, sometimes not. These disproportionate time-scales seemed profoundly unfair. As reviewers and editors we wished to compensate for this inequity with more generous deadlines, longer reviews, where possible, and an honest disavowal of critical ‘objectivity’ in favour of considered and informed subjectivity. RealTime has been published by Open City, a company we formed to produce collaborative performances and other works in 1987. The name reflected our desire to be open to new art experiences, to collaboration, and to generating a sense of community. In 1994 we launched RealTime, the title indicative of a focus on live performance in music, sound, dance, opera, theatre, contemporary performance and performance art at a moment when cross-artform practices were beginning to flourish and new temporalities were being generated by new media art, often at the intersection of the real and the virtual. These works required increased attentiveness from reviewers dealing with multiple artforms and having to find the language with which to express unprecedented experiences. We often encouraged our writers to compose in present tense in order to evoke a sense of immediacy. And, forestalling a rush to judgment, we also asked for vivid, concise evocations of what the reviewer saw, heard and otherwise sensed — attentive to a work’s surface, comprising as it does much of the evidence with which the reviewer plays prosecutor, defense, judge and juror, whether a final judgment is made explicit or is implied. We hoped that each review would draw the reader into that same experiential loop, providing a palpable sense of works often unlikely to be seen by many readers across Australia and beyond. Above all, we sought fidelity to the work, a descriptive evocation, regardless of final judgment. Reviewing demands heightened sensory awareness. There is nothing passive in being fully open to a performance. Engaged, we seem to forget our bodies and conscious selves, but contrary to this apparent emptiness we loop with the work, interiorising bodies and voices and design, a dancer’s sway, an instrument’s reverberance, the deep pull of gravity and release from it in circus, and in dance and music too. Visceral art hits the gut, sensual art brushes against the skin without touching. We shiver with fear, we sweat, hold our breath. Ideas delight, thrill, inspire, frighten or offend with palpable force. New media works test, disorient and expand our perceptual abilities. Relational art places our bodies inside the art, sometimes as co-creators, radically reducing the space between work and audience in the art-making loop. Time is felt: the near-indescribable tension between moment and momentum in much art. Elsewhere we treasure the moment, welcoming imagistic works that refuse narrative compulsion, or, in recent dance and performance, seek transcendence and authenticity in ecstatic states and the ‘now.’ A vast number of works from at least the 1990s to the present have focused on the complexities of body, mind-body and perception in all their physiological, social and political dimensions, requiring of reviewers unprecedented attention to the work, self- awareness, and the demands on knowledge brought on by proliferating cross-artform and hybrid practices. One of our occasional workshop exercises involves participants self-reviewing (how they see themselves, how they engage socially). As the learner-reviewer grows cognisant of the workings of the loop, registering each intellectual, perceptual, visceral response, they learn there will be moments when the exchange between reviewer and work falters or the loop locks or breaks. Often the first impulse is to blame the work. A better response is to first query one’s attentiveness or courage to risk the vertigo of new experience, to put oneself in the way of risk-taking artists, to become a risk-taker, share in the ways a body can say, think, be. Unless the response is hurried, formulaic and premediated, the real time of writing a review is intense, the work experienced is re-lived and newly imagined; one’s preconceptions have to be denied, ignorance acknowledged, vocabulary tested and expanded, the means to address work, artist and reader grappled with — review as statement, essay, prose-poem, combinations of these. As the loop turns, as images settle and the work’s shape becomes clearer, the reviewer can be surprised at their re-estimation of the initial response, partly rational, partly as if the review is writing itself, partly like dream work — making sense of why elements of the work provoked feelings of discomfort, unlikely pleasure, or of a haunting. Artists are profound sharers. Whether seen as conduits, gatekeepers or judges, reviewers too are sharers. Ecologically, they might be seen as parasites (sometimes advantageously for art, as per Darwinian mutualism) or pollinators (attracted to art they spread its affects, at best making ‘honey’ of their writing) or, alternatively they are inhibitors and predators. In the era of YouTube and video documentation, reviewers are potentially supplantable, but the screen cannot tell what it was like to ‘actually be there’ and, when art and reviewer are as one, becoming part of an enduring loop. The reviewer’s compulsion to share their responses publicly is driven by considerable self-belief, varying degrees of expertise, and a passion to understand, belong to and have free access to an artistic milieu and its works. It might be driven by a felt need to support a particular form, a group of innovators, or specific communities. Whatever the motivation, the responsibility is enormous, not least now as reviewing is reduced to likes and blunt opinion-making while seeking new forms and platforms. Given the enormous temporal disparities between the making of a work and the execution of a response, the review must above all be humble before art, address it with fidelity and openness, alert to the workings — aesthetic, intellectual, intuitive, instinctive, perceptual and corporeal — of the loops that bind us enduringly to art and which represent the ways art transforms us, perhaps temporarily, possibly permanently. The works of Martin Del Amo, Vicki Van Hout and Branch Nebula (Lee Wilson, Mirabelle Wouters) have become a part of our lives. They have changed us in the ways we experience and understand the expressive potentials of dance and contemporary performance. Each of these artists has a very special sense of space and design. Collectively, they bring unexpected subject matter to performance — the everyday, sport, play, work, cultural heritage, and idiosyncratic personal and political concerns. They are also intensely collaborative, working at various times with suburban and regional communities, sometimes with those seemingly unlikely to associate with art. The experiential loops they generate go well beyond individual works. It has been our honour and pleasure to engage with their creations and bring our readers to recognise their enduring importance. We are deeply grateful to Erin Brannigan for initiating and co-curating In Response: Dialogues with RealTime with the participating artists, to UNSW Library for presenting the exhibition, and to the project’s other partners. We thank UNSW Library and the National Library of Australia for partnering to place RealTime print editions 1994- 2015 online on the TROVE site. We also greatly appreciate the Australia Council for the Arts’ decades of support for a bold publishing project, Guardians of RealTime members Erin Brannigan, Gail Priest, Caroline Wake and Katerina Sakkas for their passion to preserve the RealTime legacy, and Open City’s Board, Tony MacGregor, John Davis, Julie Robb, Urszula Dawkins and Phillipa McGuinness, for their collective wisdom and unstinting encouragement. 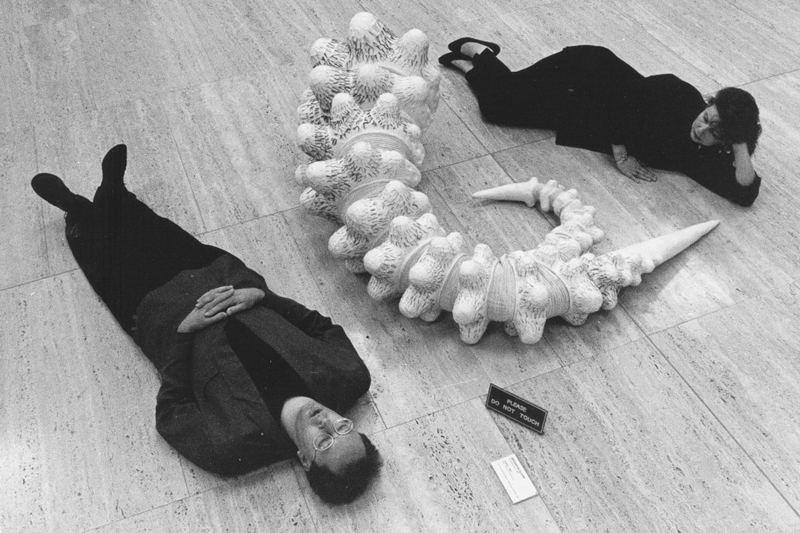 Top image credit: Keith Gallasch, Virginia Baxter admire Unicorn (1984) by Bronwyn Oliver in performance titled Small Talk in Big Rooms, Writers in Recital, 1991, Art Gallery NSW. Sculpture collection of and image courtesy Art Gallery of NSW.